WhatsApp has finally added a new feature in Group Chats that allows you to mention a particular member in the group. Users can now tag individuals in a group chat. For users that are in group with many members, this could be a useful way of communicating with one particular person. WhatsApp has sometime announced that it plans to bring new Services to the app and a report from leaks might have confirmed it revealing that WhatsApp plans to add new features like the ability to scribble on photos, as well as selfies with flash on the app soon. WhatsApp was rumoured to bring the feature earlier this year, but it has taken some time for the feature to surface. WhatsApp has already experienced a lot of feature updates in the past few months such as the ability to format text (bold, italics, underline), share PDFs, Docs and files from third-party apps like Google Drive, iCloud and Microsoft’s OneDrive. 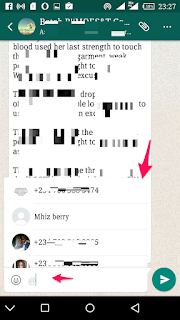 Just type @ symbol inside a group chat as seen in the screenshot above, and it will start showing the names of group members you can tag. Tap on the name of the person you wish to mention, and then send the message. 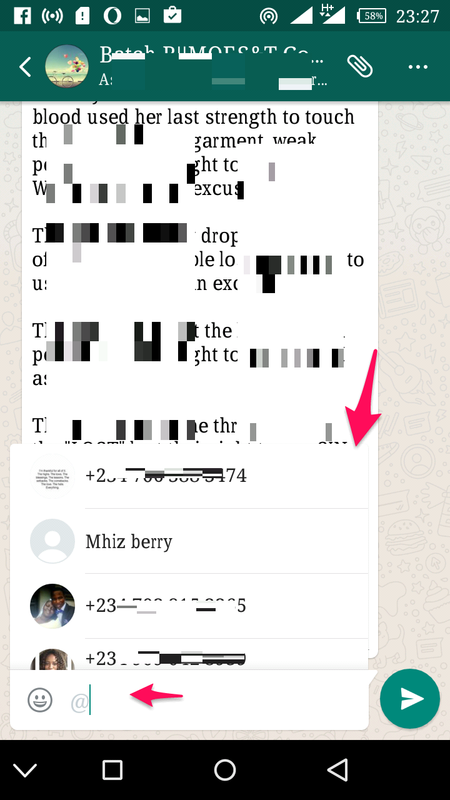 The advantage of this feature is that you can pick out a specific person in the Group chat for whom the message is meant. Or better still in case of a group fight you can at least pick the specific person you’re targeting, while the rest choose to ignore the messages.